Plains Blackfoot grows on sandy or rocky sites on the plains. 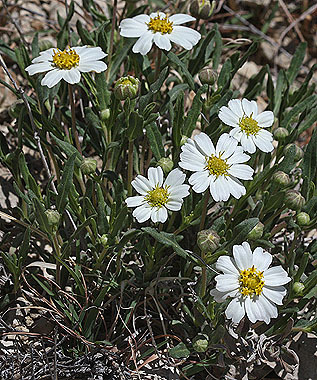 The white daisy flower heads are about 1-inch in diameter. Plants grow as small clumps. Leaves are opposite, narrow and have entire or shallowly-lobed margins. Compare to Rose Heath (Chaetopappa ericoides), which can be found in similar habitats. Rose Heath has narrow, awl-like leaves and narrower ray flowers.